1: You must agree to the below Terms and Conditions. Divers must arrive at SEA LIFE Melbourne no later than 15 minutes prior to their scheduled briefing time to be checked in for their dive. - 11:00am - Divers are required on site at 9:45am for a safety briefing/induction. - 2:30pm/3:30pm or 4:30pm - Divers are required on site at 12:45pm for a safety briefing/induction. IMPORTANT: If your dive is booked in from December the 7th onwards the times are as follows..
- 10:00am/11:00am - Divers are required on site at 8:45am for a safety briefing/induction. - 2:30pm/3:30pm -Divers are required on site at 12:45pm for a safety briefing/induction. Late arrival or failure to attend the allocated briefing session will result in non-admittance and will forfeit your dive session. All dives are non-refundable and will incur a rescheduling fee. Failure to pass the medical declaration on the day will also incur a reschedule fee. 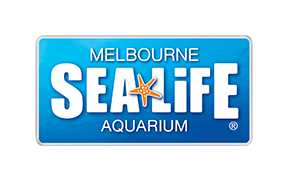 SEA LIFE Melbourne will refuse admittance to any person who is under the influence of drugs or alcohol or behaving badly in an offensive or uncooperative manner. Personal underwater cameras are not permitted on this experience. Please note: As we cannot predict how the animals will behave for every dive, this experience cannot guarantee that a shark will approach every diver in the tank.